We are pleased to announce Upstate’s 2018 Community Giving Campaign. More than 550 agencies benefit from your support. The generosity of Upstate’s employees has made our campaign one of the most successful in the SUNY system and in Central New York. Last year, Upstate employees raised $560,958. We hope that you will join us in participating in this important initiative and help us reach our goal to increase employee participation beyond 20%. On October 1, you will receive an email from Self-Serve with a link to ePledge. This is an easy way to donate to the campaign and take advantage of the two-week incentive promotion. You may be one of the $100 daily winners! Once again, Zanette Howe is the campaign director and Linda Veit will handle leadership gifts ($1,000 and up) through the Hamilton White campaign. New this year, those who make a year-long pledge of $2,000 or more are members of the new Elizabeth Blackwell Society, named in honor of the 1849 graduate of our College of Medicine and first woman MD. If you have any questions, please contact Zanette at 464-4836 or howez@upstate.edu or Linda Veit at 464-6303 or veitl@upstate.edu. We hope you will find it possible to support Upstate's Community Giving Campaign. Your participation, at any level, is essential to our success and the well-being of the thousands in our community and beyond. Together, our gifts will help build a stronger future for our neighbors, families, and friends. 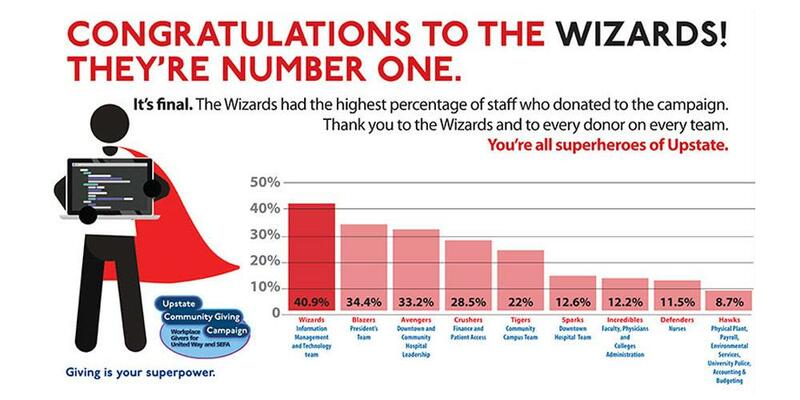 THE WIZARDS are the top team with 40.5% participation! Call 464-4836 or download a pledge form. Last Modified: December 20, 2018. Contact Zanette Howe with questions about the content of this page.